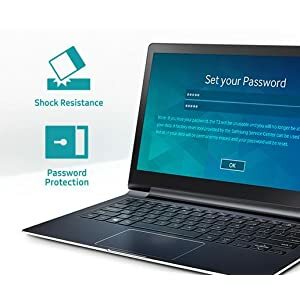 With no moving parts, a shock-resistant metal body that withstands drops of up to 6.5 feet, and built-in AES 256-bit hardware encryption, this SSD offers complete data protection from the inside out. 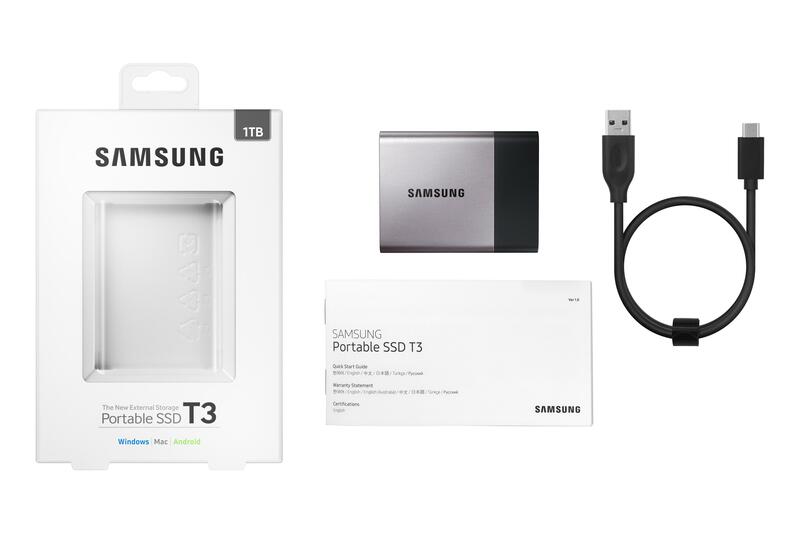 Built strong and light for potent portability, the Samsung Portable SSD T3 allows you to store and access huge amounts of data. 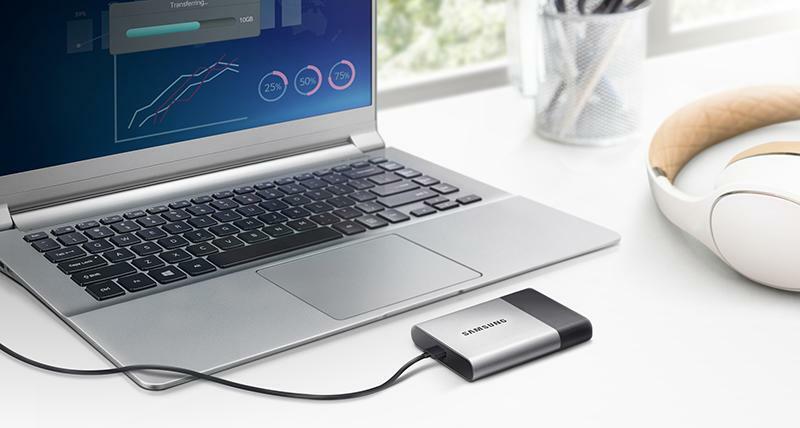 With a capacity of up to 1TB, this sleek SSD fits easily in your pocket, so you can take all your data with you anywhere you go. 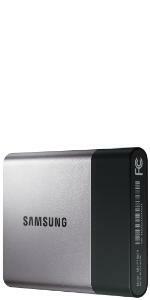 With blazing-fast read/write speeds of up to 450MB/s,* the Samsung Portable SSD T3 allows you to transfer data in seconds. 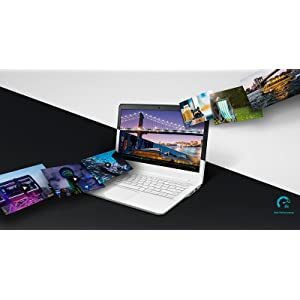 These transfer speeds are up to 4x faster than those of traditional 2.5 inch portable hard drives,** raising the bar for speed and capacity in portable storage. 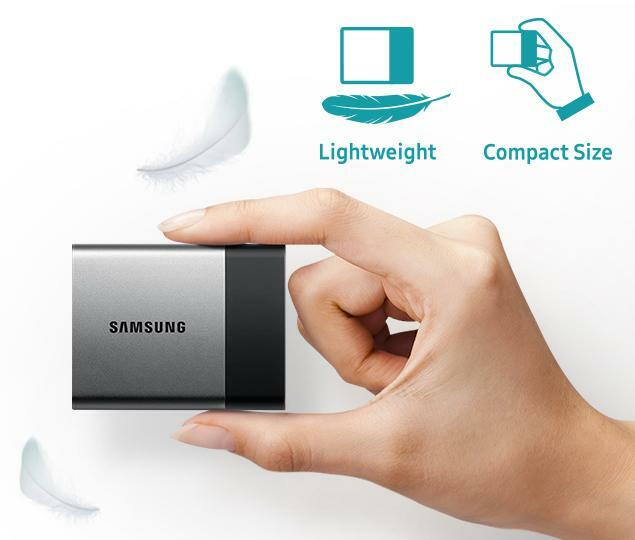 The Samsung Portable SSD T3 weighs less than two ounces*** and measures roughly the same size as a business card, delivering next-level speed, capacity, durability, and connectivity in a truly compact design. 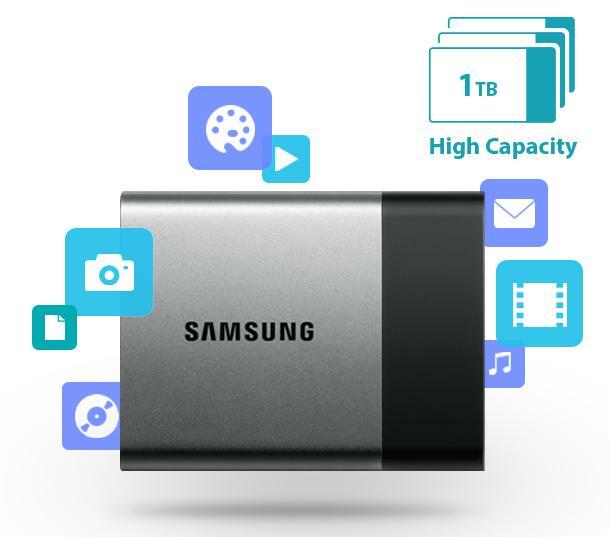 The Samsung Portable SSD T3 uses Samsung 3D vertical NAND (V-NAND) technology to increase density, performance, and efficiency while creating a smaller footprint. 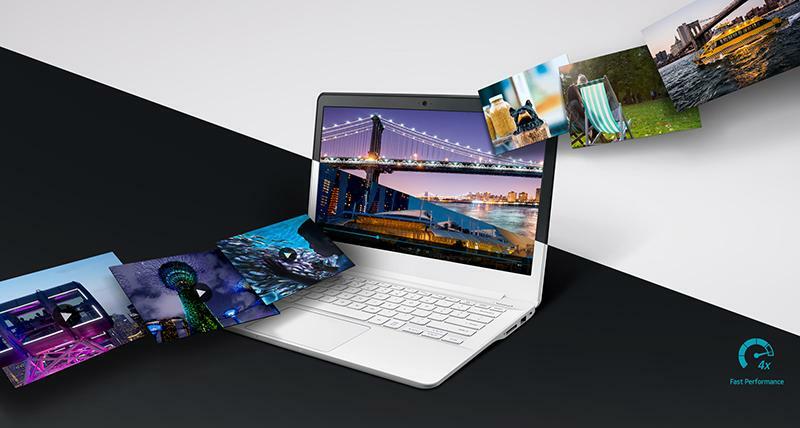 This revolutionary vertical design allows the SSD T3 to hold large amounts of data in a compact drive that fits in the palm of your hand. 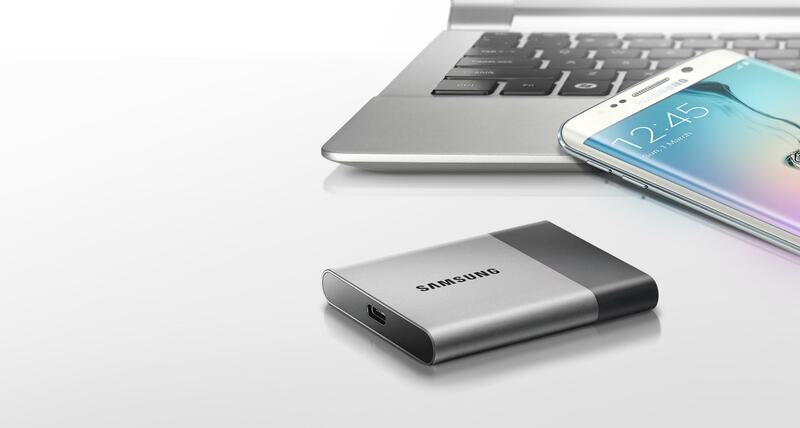 Designed with no moving parts, the Samsung Portable SSD T3 features a shock-resistant metal case and internal frame that can withstand up to 1500G of force–the equivalent of a 6.5-foot drop. 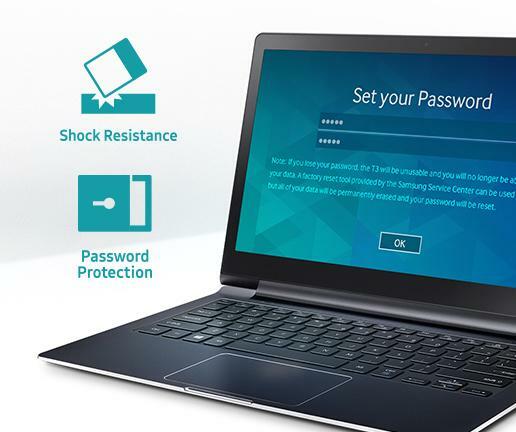 Plus, AES 256-bit encryption algorithm protects your data. 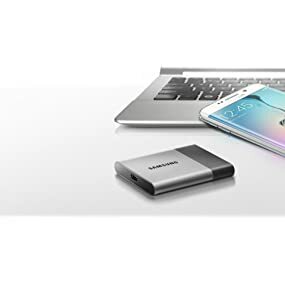 The Samsung T3 SSD features a USB 3.1 Type-C connection port, so you can use your T3 SSD with the latest devices, including Windows Ultrabooks, MacBooks, Android tablets, and smartphones. 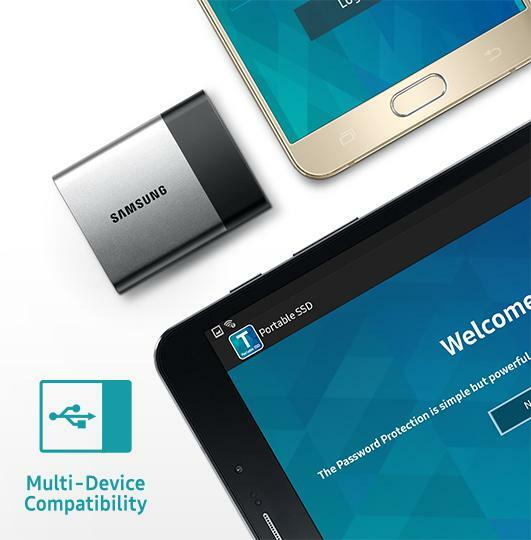 **** You can also use your SSD T3 with other older devices supporting USB 2.0 ports using the included USB Type-C to Type-A adapter. 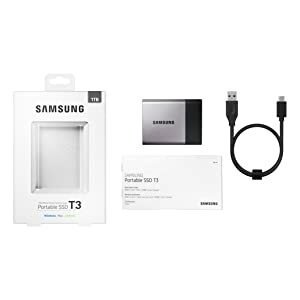 Samsung Portable SSD T3, quick start guide and warranty statement, and USB Type-C to Type-A cable. 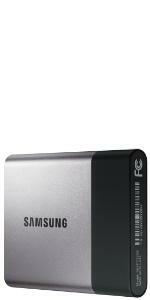 *Performance may vary depending on host configuration and data type. 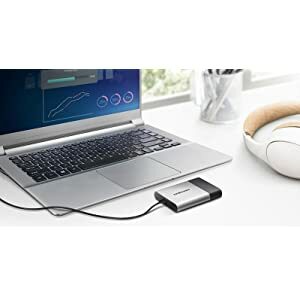 USB 3.1 connection, internal SSD, and UASP mode must be enabled. **Compared to traditional spinning platter portable hard disk drive (HDD); performance may vary depending on host configuration and data type. USB 3.1 connection, internal SSD, and UASP mode must be enabled. ***Exact weight of product may vary by capacity. 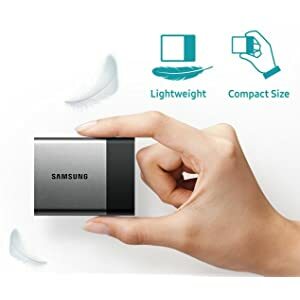 ****Type-C to Type-A adapter included. Additional adapters may be required (sold separately).